Good morning, Nashville. 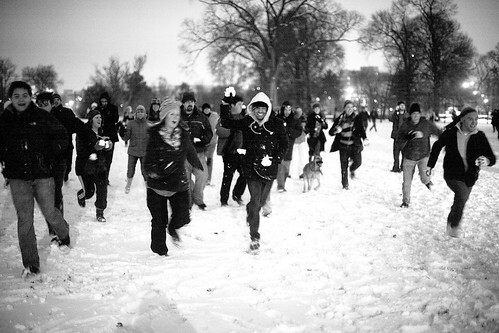 Well done with the citywide snowball fight last night! We’d guess around 100 of you turned out and pelted each other to your hearts’ content. Battlecries were shouted, alliances were formed, news crews were ambushed, and some strangers even united to build an impressive 7-foot snowman. The snow is supposed to taper off today, but then temperatures will plunge into stupid-cold territory with lows in the teens tonight. We won’t see anything above the mid-20s until Friday. As such, black ice will continue to be an issue, so please drive carefully! 5-1-1. Speaking of road conditions, Tennessee’s 511 service received a record-breaking 186,000 calls during the month of December. If you ever get in a bind, you can call 511 for updated conditions of major roads and highways. Snow dance! Please watch this video of this little girl doing a snow dance which she believes is the cause for all of the snow we’re getting in the midstate. It will make your day. Bits & pieces. Rutherford County is trying to diversify their school system by using socioeconomic status to draw school districts … This article is worth clicking on solely for the accompanying picture of Musica … The Nashville flea market will be around for at least one more year … Poor Gallatin had no water yesterday.